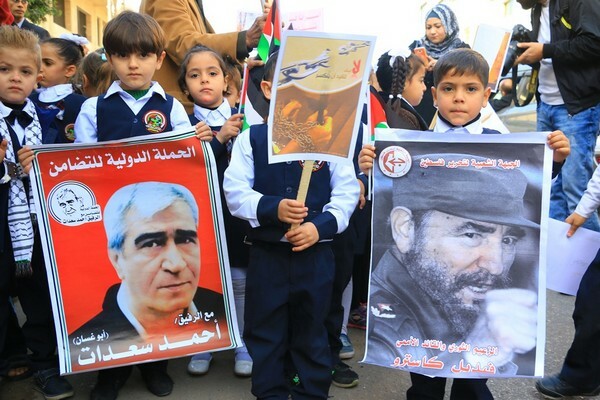 PFLP in Gaza salutes Fidel Castro with demonstrations, houses of mourning | Fight Back! Gaza mourns passing of Fidel Castro. The Popular Front for the Liberation of Palestine commemorated the life and struggle of Cuban leader and international socialist and anti-imperialist figure Fidel Castro on November 28, as part of the demonstration in support of Palestinian prisoners on hunger strike in front of the International Committee of the Red Cross (ICRC) headquarters in Gaza. With a wide participation of leaders, cadres and members of the Front, the Prisoners’ Commission, representatives of Palestinian political organizations and freed prisoners, participants raised posters of the late revolutionary leader and the slogans that embodied his position and principles. They expressed that his departure was a loss for the Palestinian people and all progressive movements. Yasser Saleh of the Mohja Al-Quds Foundation spoke at the event as well, highlighting the urgent situation of Palestinian hunger-striking prisoners, Anas Shadid and Ahmad Abu Fara, who have refused food since September 25 to demand their freedom from administrative detention. He emphasized that they were committed to continue their struggle until victory, declaring the full responsibility of the Israeli occupation for their lives and health.